It’s a chocolate cake. It’s a chocolate pudding with a luscious sauce. It’s made from just one batter. It’s magical. And its official name is Chocolate Self Saucing Pudding. Chocolate lovers from around the world, please meet your new best friend aka the magical, gooey Chocolate Self Sauce Pudding. If you’re a regular reader around here, you probably know about me and my love for all things chocolate. I can’t go more than a few days without posting a chocolate recipe on my blog, and that’s because I think in some other life, chocolate and I were soul mates. 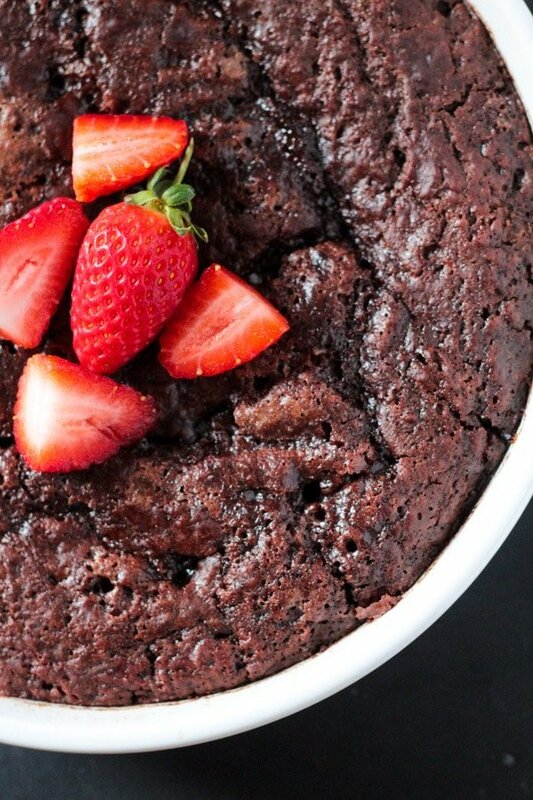 So let’s talk about this beautiful Chocolate Self Saucing Pudding, a bit more shall we? I could talk about chocolate all day long. So this is truly a magical recipe. No, no don’t worry the chocolate hasn’t gone to my head. But I like to call it magical, because we only make ONE batter for this recipe, yet it turns into two separate layers…a soft chocolatey cake base, and my favorite part: a fudgy chocolate sauce! 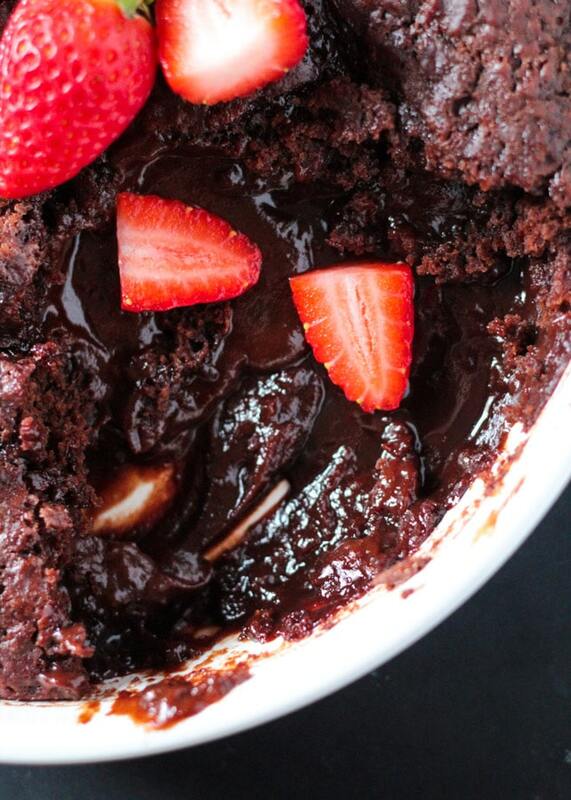 So it’s kind like molten lava cakes, BUT it’s made in one dish and there’s a whole lot of it. Also, it’s less fussy than molten lava cakes are. 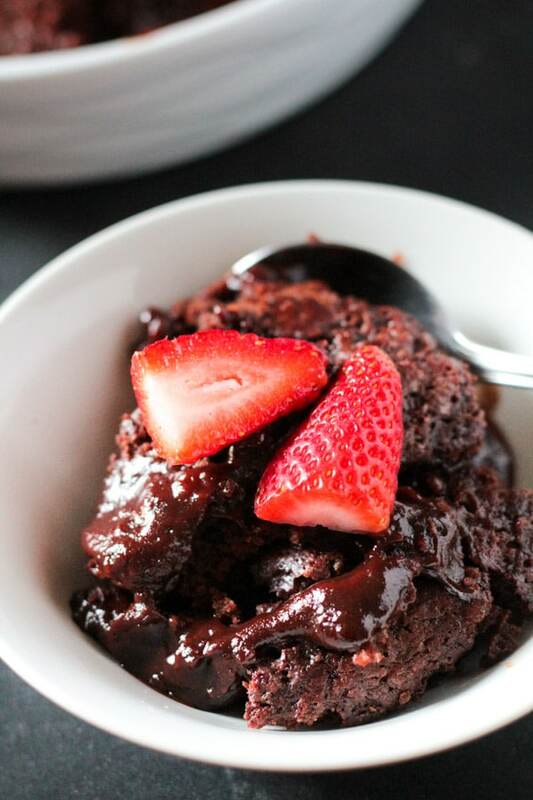 There are just a couple of things you should watch out for when making this Chocolate Self Saucing Pudding, so I’ve outlined these tips below for you! 1.) Start by pre boiling the water for the chocolate sauce in a kettle. 2.) There are two parts to making the Self Saucing Chocolate Pudding: the cake batter & the chocolate sauce/pudding element. The cake batter is fairly simple to make. Just mix together the dry ingredients, and then add in the wet ingredients. Then pour this cake batter into the prepared baking dish. 3.) For the chocolate sauce/fudge element of the recipe, you first have to sprinkle a mix of dry ingredients onto the surface of the cake batter. This includes white granulated sugar, brown sugar and cocoa powder. Once you’ve sprinkled this magical mix onto the cake batter surface, you pour over boiling water on the entire surface of baking dish. DO NOT MIX OR STIR IN THE WATER AFTER YOU POUR IT OVER THE CAKE BATTER SURFACE. During baking, the top surface will sink to the bottom of the dish, and the cake batter will rise into a cake. Hence, the top surface will transform into a fudgy chocolate sauce. 4.) Do not over bake the cake. It will take about 35 minutes in the oven, and the centre will be almost set, but not completely. It will have a slight jiggle to it. 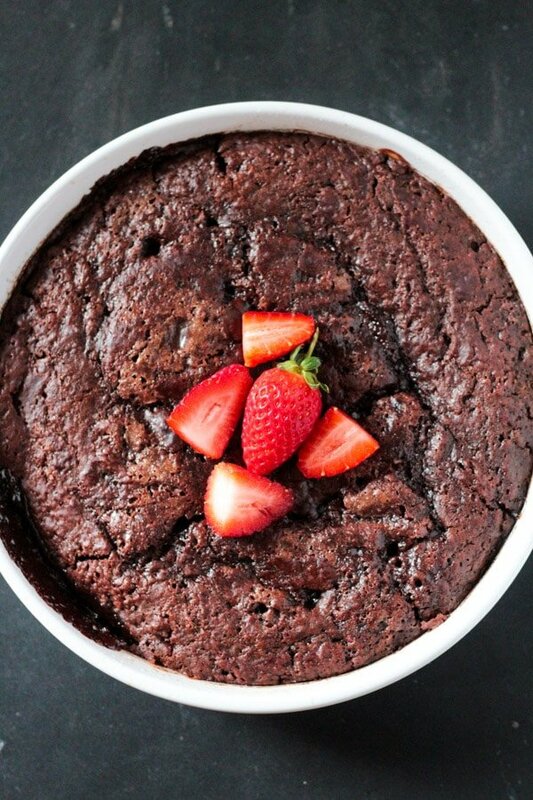 And that’s about it…in about 45 minutes this delicious, mouthwatering and ooey gooey Chocolate Self Saucing Pudding will be ready for you. And then you can thank me once you’ve had the blissful experience of tasting this divine dessert. 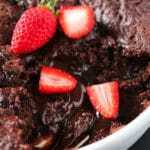 Now I’m off to have this Self Saucing Chocolate Pudding recipe with a big scoop of vanilla ice cream! Eggless Chocolate Mousse – Only Three Ingredients! 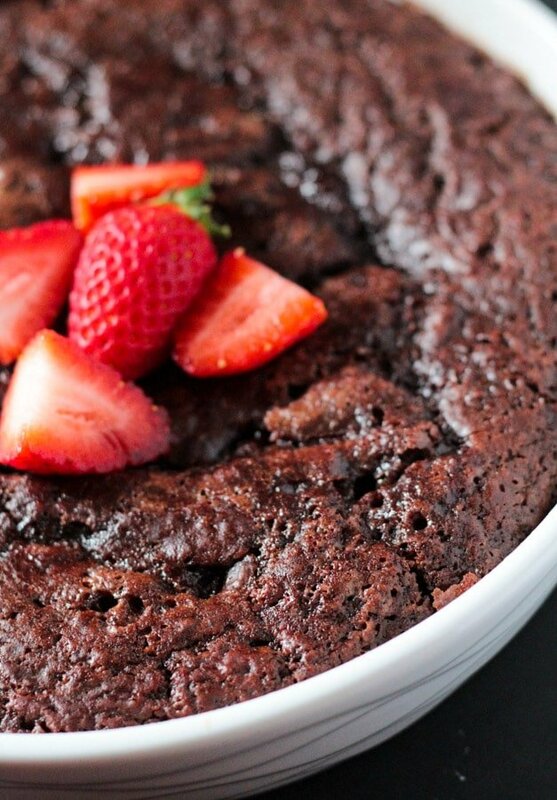 Chocolate Self Saucing Pudding is a super fast and delicious dessert to make. 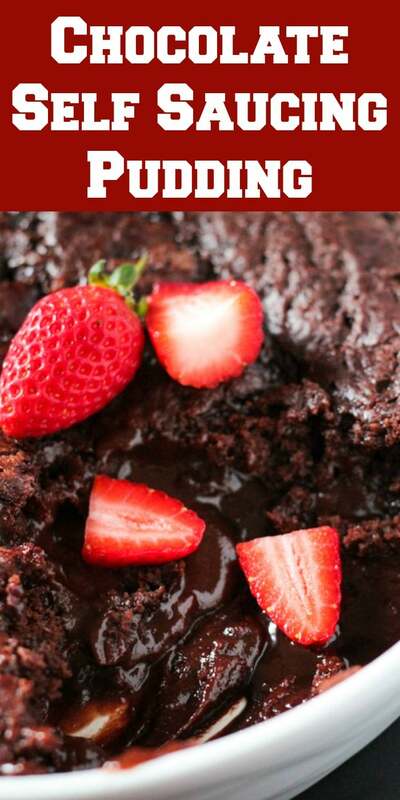 One batter that transforms into a cake, and a chocolate sauce when baked! Preheat oven to 350 F / 175 C. Lightly grease a 9 inch baking dish. Also pre boil water in kettle for the chocolate sauce. In a medium sized bowl, combine the dry ingredients: flour, white granulated sugar, cocoa powder, baking powder and salt. Whisk lightly until combined. Then add the wet ingredients: milk, butter and vanilla extract. Mix until combined and fairly smooth without too many lumps. Batter will be thick. Combine the dry ingredients: granulated sugar, brown sugar and cocoa powder in a bowl. Sprinkle this mix evenly onto the surface of the cake batter. Do not mix. Slowly pour the boiling water onto the surface of this cake batter, making sure it evenly covers the whole surface of the baking dish. DO NOT MIX OR STIR THE WATER INTO THE BATTER. Place in the oven, and bake for about 35 minutes, until the edges of set and the centre is only slightly jiggly and is almost set. Can’t beat ooey gooey chocolate! This is just perfect for the holidays! Pinning!